Description: Old photo scan: North Shore Line coach in the process of being restored. 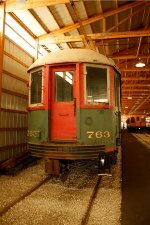 Description: #763 was upgraded by the North Shore Line’s Highwood Shops to a "Silverliner" in March 1958. Subsequently, when acquired by TWERHS (at East Troy, WI) it was repainted to a earlier “Greenliner” scheme. Despite the backdated paint, the other modifications made during the “Silverliner” conversion were not undone. Hopefully this car’s anachronistic paint will be corrected eventually. Right now the focus has been on restoring the mechanical systems. Description: Interurban coach; built by Standard Steel Car Company in 1930.